Whether it is your fourth or your first, having a new baby can be overwhelming. The first week can be especially tough. 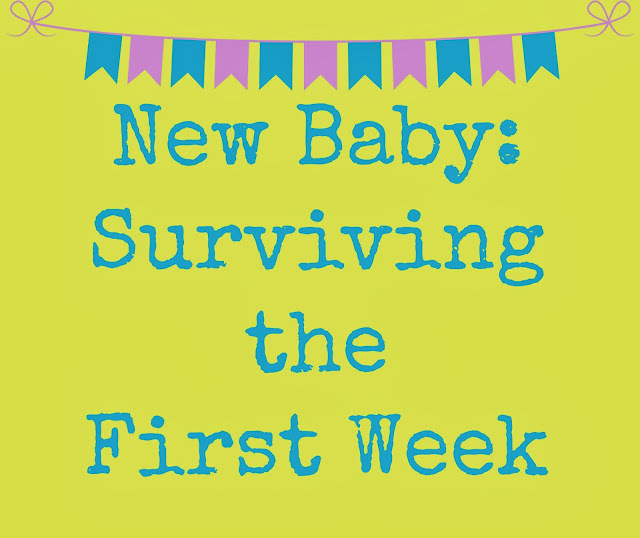 I have officially survived 4 "first weeks", so I'll pass on a bit of what I have learned. 1. Enjoy the hospital. I know this sounds insane, but really-just enjoy it. Enjoy having a bed that goes up and down. Enjoy someone bringing you your medicine. Take advantage of the nurses and ask them to watch the baby while you shower. Who knows the next time you'll get one? 2. Let others help, and ask for help if no one offers. I know this is a hard one for most of us. There is something bred into us that says asking for help is weakness. I know I felt like a lazy bum just sitting on the couch while my mom and husband did everything, but being lazy was exactly what I needed. 3. Don't feel guilty about paying attention to your new baby. I was given the guilt trip on more than one occasion for paying too much attention to the new baby and not enough to my other kids. If you are in the first week after giving birth ignore people like this. Feel free to throw a pillow at them if you'd like. I'm not saying to pretend that the older children don't exist, but if there are people around to help you, let them amuse the older kids while you figure out nursing and get some newborn snuggles. 4. Drink a ton of water. I know from personal experience that dehydration will make you feel like absolute crap after having a baby. Drink, drink, drink. 5. Don't overdue it! You may be surprised to find that you feel great that first week. You may want to go shopping, entertain friends, and return to your regularly scheduled life, but don't. Just don't. On day 8 you are going to feel it, and odds are good that the help you had that first week may be gone. Take it from me. I made that mistake after this baby. I felt like Super Mom that first week, and ended up miserable, sick, and taking care of 4 kids on my own the second week. Good luck, Mamas. You can do this! Having an accumulation about 6000 fragrances, your option is among the most fake gucci bags on the market thru all on line parfum retail outlet, so its possible to move forward knowing that when everyone see MyPerfumesOnline, they can provide the discount guys cologne that you're seeking out on a expense shipment trust. For any exceptional fella in your own chanel replica, buy your collection of discount guys cologne. Any Daytona stands out as the identity of each genuine Rolex types of see. Quite often often known as some sort of "Oyster. Pro fake chanel, " any Daytona has got generated any nickname for "racing driver's solution. " It had become intended to estimate elapsed point in time as well as evaluate standard acceleration from a rush. To get understood so why many ladies love to own replica chanel handbags around cool the baby sacks, especially when should be choose scattered with the toddler. Any clutch system chanel outlet at all times mode a very powerful option for that gal able to get ready for the afternoon occasion. Wthout using wonderful afternoon clutch system container, any make-up and also way outfits appear to be chanel replica handbags bleak together with incomplete.